Being an Assassin requires training and the right tools. Enter the Assassin’s Creed Kinetic – Technical Jacket. With this official jacket, you too will be able to master your skills and show off with this light weight, high performance jacket. Designed for an active lifestyle, this jacket is made from breathable mesh materials and cut for an optimal fit to allow you to perform at your best. 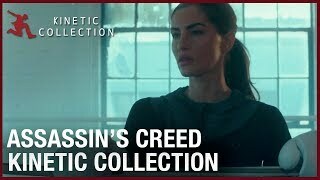 Pair it with the Assassin’s Creed Kinetic - Body Armor long sleeve t-shirt and the Assassin's Creed Kinetic - Athletic pants for an ensemble worthy of a master assassin.